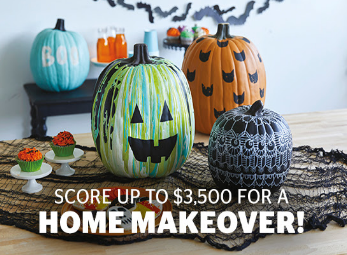 Quicken Loans No Tricks, No Treats Quikly Sweepstakes – Win $3,500! ENTER SWEEPSTAKES HERE – Joann Sweepstakes page. Promotion Registration and Entry Period. ELIGIBILITY – The Promotion is open only to legal residents of the fifty (50) United States and the District of Columbia who are at least eighteen (18) years old at the time of entry and located in the United States at the time of entry and have a valid email address. SWEEPSTAKES ENTRY PERIOD – The Promotion registration and entry period begins on September 24, 2018 at 11:00:00 a.m. Eastern Time (“ET”) and ends as soon as the live release occurs, which will be no later than September 29, 2018 at 1:00:00 p.m. ET. priced item. Valid 9/28/18 – 10/1/18. WINNER’S LIST – For a list of winners, mail a self-addressed, stamped envelope to: Social Media Team Quicken Loans, Inc., 1050 Woodward Avenue, Detroit, MI 48226. Request must be received within 30 days of the end of the Promotion Registration and Entry Period.